1. In a large resealable plastic bag, combine the soy sauce, onions, brown sugar, garlic, ginger and pepper. Add the steaks. Seal bag and turn to coat; refrigerate for 8 hours or overnight. 2. Drain and discard marinade. 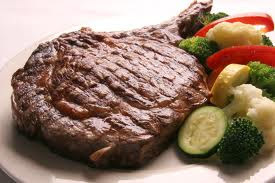 Grill steaks, uncovered, over medium-hot heat for 8-10 minutes or until the meat reaches desired doneness (for medium-rare, a meat thermometer should read 145 degrees F; medium, 160 degrees F; well-done, 170 degrees F). Enjoy the rib eye steak marinade !